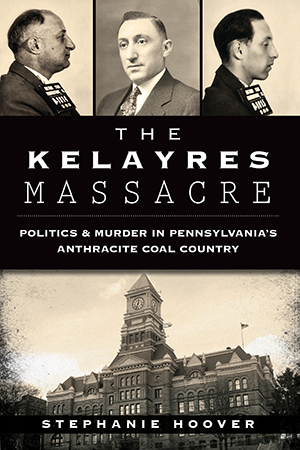 The 1840s witnessed the advent of two critically important events in Pennsylvania's history: the start of the immigration of Irish Catholics, and the commercial production of anthracite coal in the counties of Schuylkill, Carbon, Luzerne and Lackawanna. Unlike the Protestant Scots-Irish who had appeared in the Commonwealth in the 1700s, the Celtic or Catholic Irish arrived in this country with two strikes against them: their ethnicity and their religion. Pennsylvania coal towns were filled with Irish laborers and their families, often working for the same class of English and Welsh overseers that had forced them out of their own country. The strongest wave of Irish immigrants arrived between 1840 and 1860, a period when our nation navigated the turbulent seas of pre-war unrest. It is this unrest that is credited with the birth of the Mollie Maguires. Though the National Conscription Act was not effective until 1863, the Pennsylvania legislature had - in the fall of 1862 - already authorized the drafting of men for nine month periods of service in the Civil War. When it became known that mine operators were assisting in the conscription of Irish men, a group of laborers led a heavy resistance. History suggests they chose the name the Mollie Maguires to honor an Irish widow who, in the 1840s, stood up against English landlords' practice of seizing land. This spirit of insurgency reconstituted itself in Cass Township, Schuylkill County, where Col. A. K. McClure - the Commonwealth's overseer of the draft - finally secured enough fictitious affidavits to make it look as though the Civil War draft quota had been met. This course of action was, in the opinion of the day, the only way to avoid a bloody revolt. The end of the Civil War signaled a shift in the priorities of the Mollie Maguires. No longer fighting conscription, the group took up the cause of improving the working conditions of miners. It is at this juncture that modern observers take opposing views of their motives. The Mollies embarked on a calculated campaign against mine owners and operators. Those whom the Mollies perceived as unfair or inhumane received threatening drawings depicting skulls and crossbones, coffins and guns. Groups of Mollies reportedly terrorized the citizenry with wild midnight raids that sometimes included the destruction of mine operators' offices and buildings. In short time, the mayhem attributed to the Mollies escalated to murder. 1874 witnessed the killings of Mahonoy City burgess George Mayor as well as T. W. Langdon, John R. Jones, George K. Smith, and Morgan Powell - none of whom were mine superintendents or foremen. In 1875, policeman Benjamin Franklin Yost was killed in broad daylight. In August of that same year, on a day known as Bloody Saturday, justice of the peace Thomas Guyther and young miner Gomer James - himself widely regarded as a Mollie - were murdered. Perhaps the most cold-blooded killing was that of Alexander Rae, Locust Mountain Coal and Iron Company superintendent, who on October 17, 1868 was traveling by buggy between the towns of Mount Carmel and Centralia. Normally he would have been carrying the wages of his men, a cache amounting to nearly $20,000. As fate would have it, however, the payroll had been sent the day before. On this day Mr. Rae was carrying only his personal assets: a watch and $60 cash. As he approached Bell's Tunnel a group of men sprang upon him, demanding the money. Rae gave them his watch and cash and fled into the woods. The gang gave chase and Rae was shot and killed. Four men, all regarded as Mollies, were tried for the crime: Thomas Donahue (who was acquitted), Pat Hester, Pat Tully and Peter McHugh. Charges were dropped against the latter three. Unbeknownst to the Mollies, Philadelphia & Reading Railroad president Franklin B. Gowan had already devised a plan to eliminate the lawlessness terrorizing Pennsylvania's anthracite coal region. Gowan secured the assistance of famed detective Allan Pinkerton in 1873. The fee for Pinkerton's services? $25,000 and the promise of more should it be required. Pinkerton believed the only way to destroy the Mollies was to work from within. 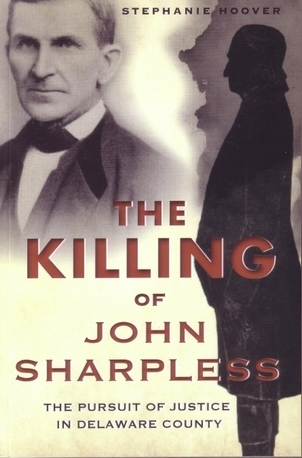 He selected a young Irishman named James McParlan, a detective in Pinkerton's Chicago bureau, as the perfect infiltrator. McParlan left for Pennsylvania in December 1873 and with stunning speed - by his own account - became a Mollie. His cover story of being a counterfeiter and murderer on the run won him the trust of the group and, shortly after initiation, he was made secretary of the Shenandoah division. He was known to the Mollies as James McKenna and fit in well with their hard-drinking, fist-wielding ways. By 1875, the Mollies suspected that the increasing number of arrests of their brethren was the product of an informant within their ranks. Suspicion eventually fell on McParlan. He managed to deflect it until 1876 when he was forced to cease his undercover activities. But by then, he had already gathered enough evidence for trial. 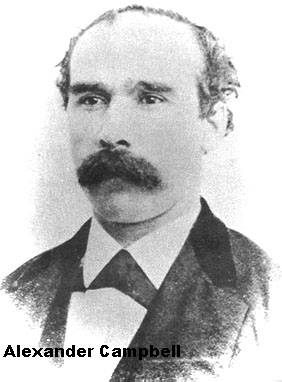 Bolstering McParlan's testimony was that of several men who had plea-bargained for freedom in exchange for testifying against their former friends. 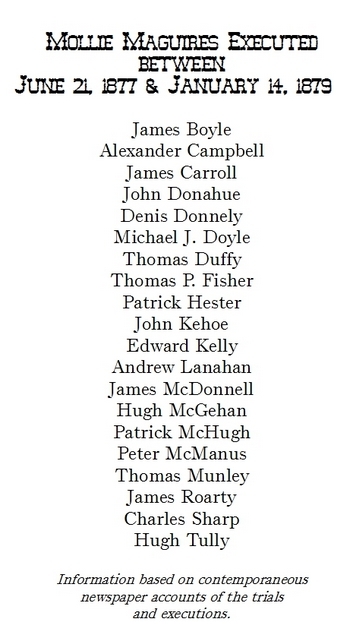 Eleven men (including the aforementioned Hester, Tully and McHugh) were found guilty of murder, and were all executed on the same day: June 21, 1877. It was known as the "day of the rope" and is considered the largest mass execution in American history. Over the next two years, nine more accused Mollies were hanged. The Molly Maguire trials were a surrender of state sovereignty. A private corporation initiated the investigation through a private detective agency. A private police force arrested the alleged defenders, and private attorneys for the coal companies prosecuted them. The state provided only the courtroom and the gallows. 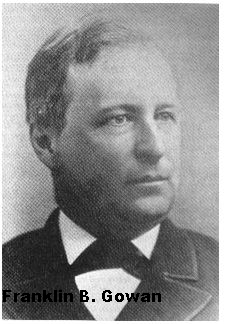 Indeed, Franklin B. Gowan, railroad president, was also a district attorney and acted as one of the state's attorneys during the 1877 trials. Then there is James McParlan. Some suggest he - at the very least - sat by while atrocities were committed. At worst, he may have incited some of them himself. Not surprisingly, descendants of both the condemned and the victims hold strong opinions. Today, the town of Jim Thorpe is a tourist destination for those fascinated by the Mollie Maguires. The jail in which several of the men were held is now a museum, and some say the right hand-print of executed Alexander Campbell remains - against all attempts to eradicate it - as eternal proof of his innocence. 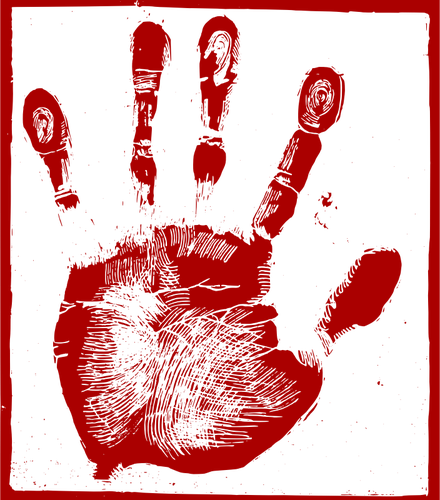 In 1994, a forensic examiner studied the hand-print for the producers of the television series Unsolved Mysteries. 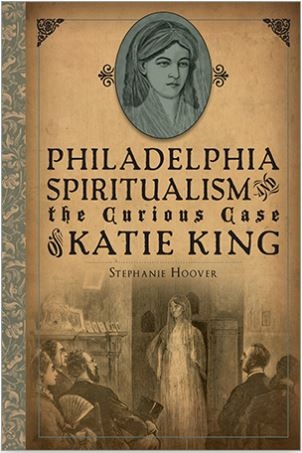 His findings were disappointing for those inclined to believe in its supernatural properties. Firstly, the print was discovered to be a left hand-print rather than the fabled "right hand to God" cry of innocence. Secondly, there was no evidence of an attempt to hide the hand-print with coats of paint or any other means. Stories of the jail's endless efforts to cover or destroy Campbell's ghostly legacy make for good entertainment, but apparently run contrary to scientific fact.